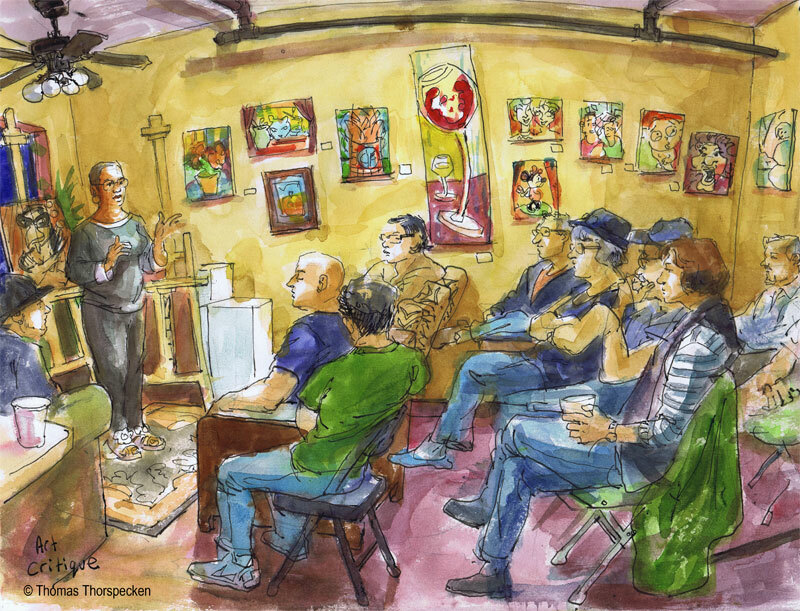 Parker Sketch organizes a monthly Art Critique Group and I always find the lively conversations enlightening. The January critique was held at the The Barefoot Spa (801 Virginia Dr., Orlando). This is a group of artists talking as peers.The discussions have included pricing, finding materials, technique, framing, exhibition opportunities, and, yes, traditional critique. We are trying to mix different artists and get them talking about art! We will be looking at every one's art individually, and talk about it for about 10 minutes. I know it is short, but the idea is not only to get other people to talk about your art, but to spend the evening talking about every one's art! Jean Claude was the first artist to show his work. Using spray paint and an xacto, he works on Plexiglass. Several pieces would change color if illuminated from behind. He works outside a gallery down in Kissimmee. His work was bold and flat. Vanessa Lisa showed some delicate pencil renderings. Mark Larsen, a photographer, had returned to his craft in the last three years. His photos featured clouds and abstract watery imagery. Artista Lulu had traveled all the way from Tampa to come to the art critique. She showed a cartoonish image of a ballet dancer standing on a tiny world. Tiffany Dae showed some of her gorgeous surreal work. She is moving to Miami where she is bound to find the arts scene to be incredibly vibrant. The artist I chose to sketch, was Phillis Taylor Harris. She had just finished filling one of the Sketchbook Project sketchbooks. The Sketchbook Project sells artists tiny sketchbooks which the artists can fill and return to go into the sketchbook library in Brooklyn NY. Phillis's sketchbook was filled with angry abstractions that were done as she went through a divorce. It turned out that her husband was abusive and a sexual predator. He worked as a psychologist, so women seeking his help would get unexpected treatment. The family home was isolated which allowed him to trap his victims. Phillis's sketchbook is intended to help victims of abuse to recover and heal. Several people in the room pointed out that Phillis should look into publishing the book with part of the royalties going to an abuse victim recovery center or shelter. I advised her to not submit the sketchbook to the Brooklyn library because they would then claim ownership to the copyright. I agree that her book could be helpful for a person recovering from abuse. I hope she can find a publisher.